In 1980, New York City passed Local Law 10, which requires buildings taller than 6 stories to have a front facade inspection every 5 years. In 1998, the City passed ratification of Law 11 which requires not only front facades but all building facades to be inspected. 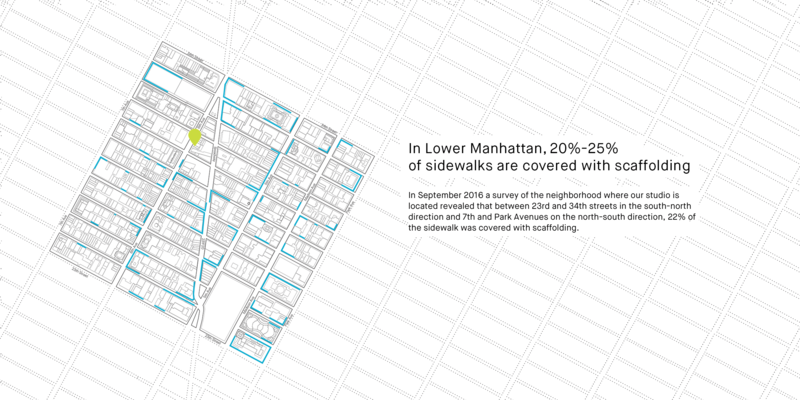 The result is the permanent presence of scaffolding in NYC sidewalks. At any given area of Lower Manhattan, 20%-25% of sidewalks are covered with scaffolding thus making scaffolding one of the most essential elements of New York's cityscape. If scaffolding is so central to our experience of public space, only accounting for public safety is not an adequate solution. 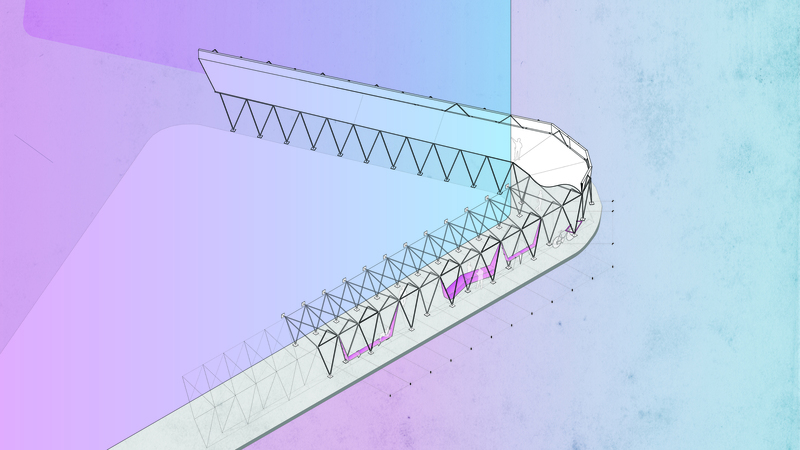 The research and design studies in this portfolio provide a new way of thinking about scaff olding: one that goes beyond public safety and enriches our experience and use of public space. Existing scaffolding structures use a conventional post and beam system with diagonal bracing elements for lateral forces. The new design looks at these basic structural elements in a maore efficient way. A series of diagonal posts and beams provide both vertical and lateral support while reducing the number of elements needed. 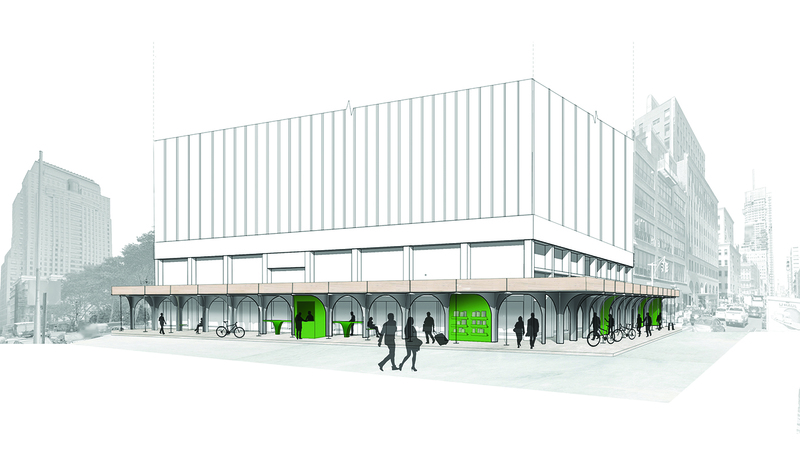 The new design proposes a clear and readable structure. 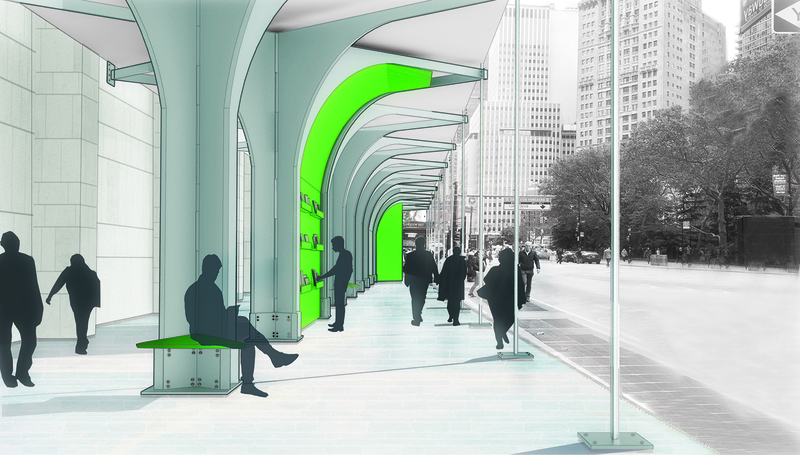 The pillars are offset from each other at ground to provide a zone at the edge of sidewalk for public furniture. 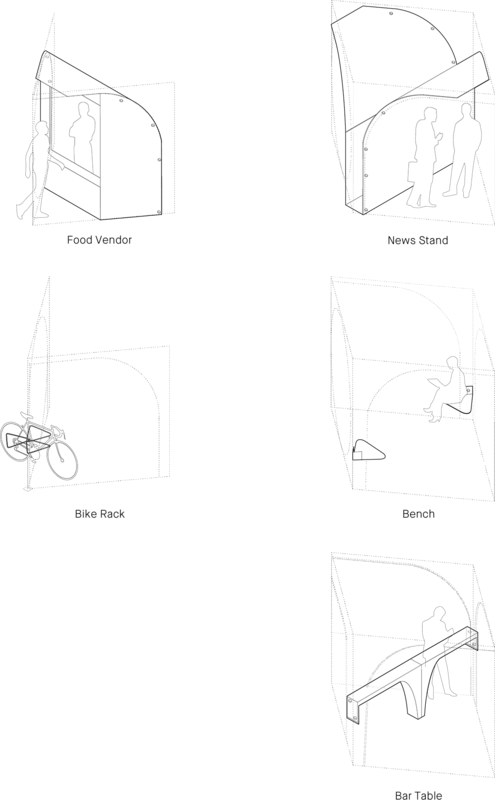 A series of kit-a-part public furniture including benches, side tables, bike racks and food vendors, slide in-between and hang on the offset pillars. 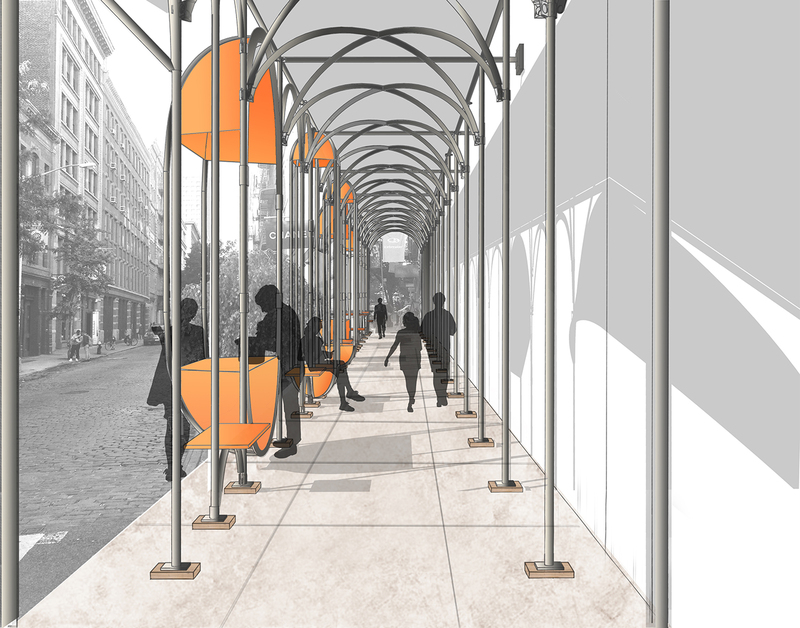 The new structural truss system, both in vertical and horizontal direction, easily stretches over wide sidewalks without additional support between pillars. If scaffolding is in a constant motion of assembly, disassembly and re-assembly, the design looks at new ways of installation on-site. 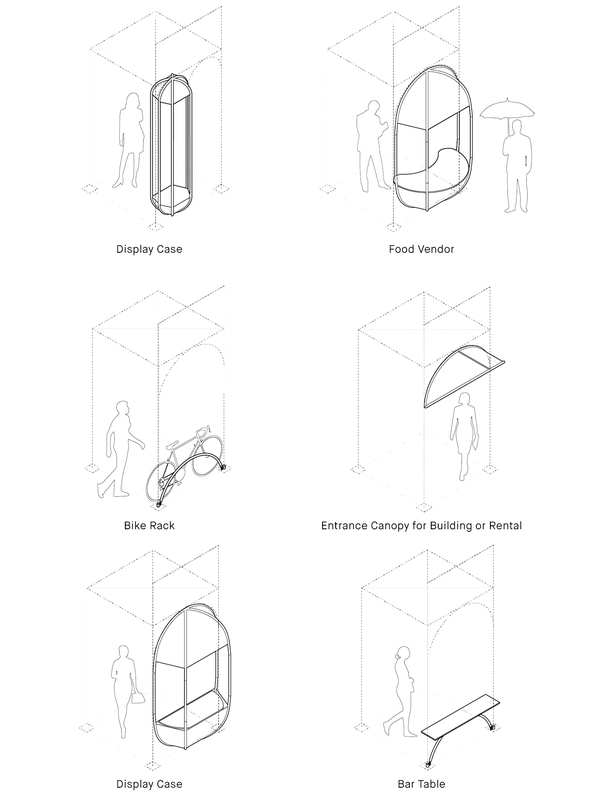 The new scheme is a folding and collapsible scaffolding system. 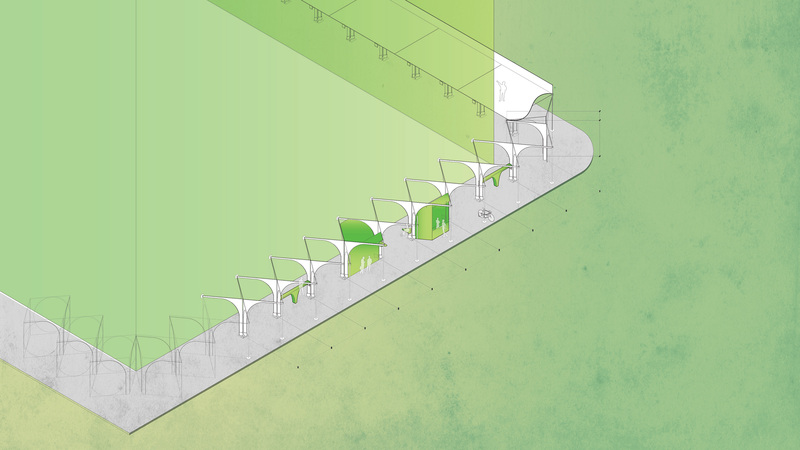 Rather than the installation of various elements on site, the design proposes an accordion structure with central pillars to reduce the assembly time, since it is a temporary structure. The arms of the structure fold out from central pillars to attach onto the building and onto vertical polls at the edge of side walk. 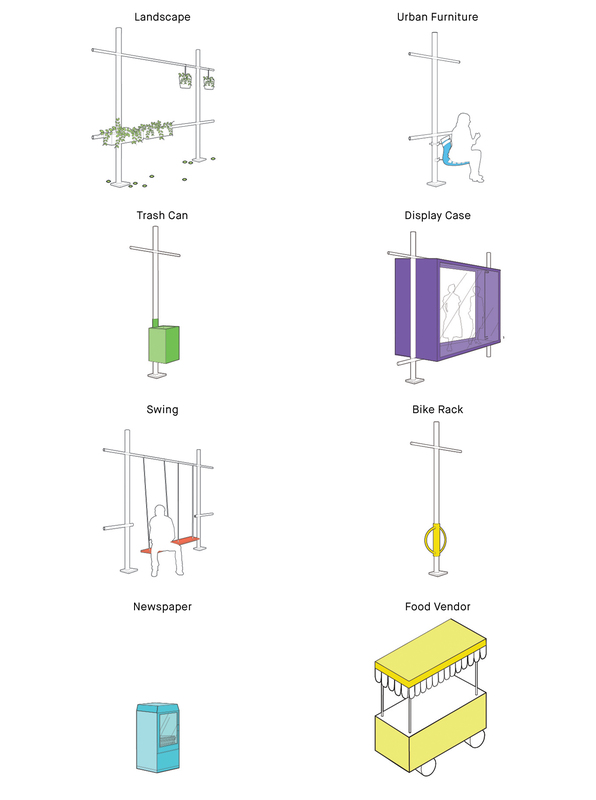 A series of kit-a-part public furniture; stools, bike racks, newspaper stands and food vendors fasten into the main pillars to provide public services. 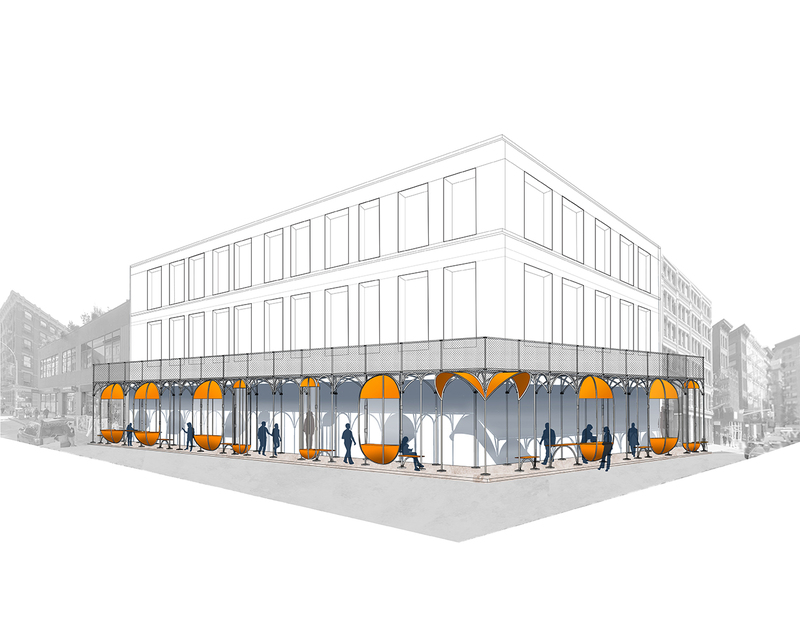 The application is ideal for wide sidewalks where the central posts can direct circulation while creating a structurally efficient canopy to cover and protect the sidewalk. In upscale neighborhoods of NYC, the conventional scaffolding system is an eyesore. The new design looks at scaffolding resembling the cast-iron buildings of Soho; elegant, well-proportioned and prefabricated elements that are economical. The proposed system allows for delicate ornamentation and quick installation on-site while providing the strength to span necessary distances. Prefabricated, kit-a-part steel poles are used for pillars and posts while the same steel rods are bent to create arches for lateral support. 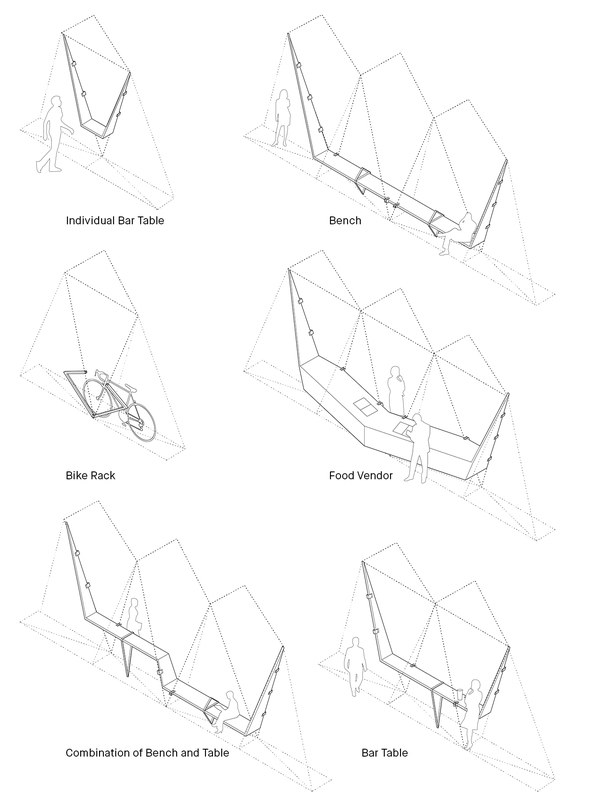 Kit-a-part public furniture including benches, side tables, bike racks, food vendors and vitrines clip onto the vertical elements. 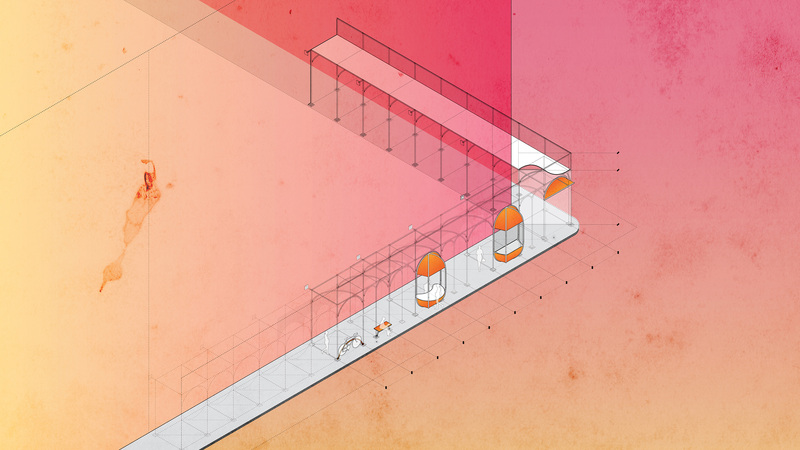 The vitrines create a second storefront for retail spaces while the entire structure provides a visually pleasing, temporary second facade for the important architectural heritage of NYC.